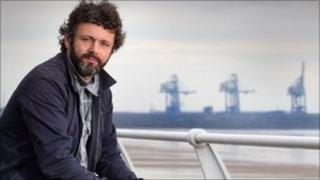 A play directed by Michael Sheen to be performed on the streets, beaches and hills of Port Talbot at Easter is also to become a film. The Hollywood actor is drafting in hundreds of locals for the Port Talbot Passion. It is inspired by the the biblical Passion Play but none of the scenes are in a traditional theatre. The Film Agency for Wales has awarded £125,000 from £425,000 to create a film out of the production. Sheen, famous for playing role such as Tony Blair in the Queen and David Frost in Frost/Nixon, has been involved with the National Theatre Wales production for more than a year. As well as acting as creative director, he will perform in the play staged at various locations from April 22 to 24. £125,000 for Port Talbot Passion, a film of National Theatre Wales' production Passion, to be directed by Dave McKean and produced by Keith Griffiths. £100,000 for Welsh based writer Philip Ralph and Swansea born director, Krishnendu Majumdar, for their feature film, Deepcut. £150,000 for Welsh born writer/director Jon Jones' first theatrical, currently untitled feature film. £50,000 to Hot Property Films for their screenplay Kelly and Victor. It is the final and largest of 13 "moving productions" set in locations as diverse as an old library in Swansea and military range in the Brecon Beacons during the launch year of National Theatre Wales. The film will be directed by Dave McKean who made Mirrormask with a theatrical release planned for later in the year. Pauline Burt, chief executive of the Film Agency for Wales, said: "Port Talbot Passion promises to provide an international showcase for a truly innovative piece of work that will celebrate the town and people of Port Talbot, whilst brimming with Welsh talent both in front of and behind the camera. "We are hugely excited to be working with a team that includes Michael Sheen and National Theatre Wales, who have consistently delivered quality and innovation." Sheen spoke to BBC Wales when he was in Port Talbot launching the project last year. He said it was inspired by the bi-annual performance of the Passion Play that he and his family attended in Margam Park when he was growing up in Port Talbot. "It's not a revival of the Passion Play - it's inspired by the Passion Play - we are going to use the whole of Port Talbot as our performance base and get as many people involved as we can," he added.